A report of the Scientific Committee on Occupational Exposure Limits (SCOEL) highlights that work-related exposures are estimated to account for about 15% of all adult respiratory diseases. Volatile organic compounds (VOC) are within working environment one of the highest cause of asthma, lung cancer, chronic obstructive pulmonary disease (COPD), cystic fibrosis (CF), and respiratory tract infections. In 2011 INAIL drew a report on occupational diseases showing that the working places with the highest percentage of respiratory diseases are agriculture, manufacturing and transportation sectors. Among those, the manufacturing sector with 5172 cases of respiratory diseases in 2010 is the most dangerous one. According to the International Labour office the best way to reduce the number of risks and of disease is, besides information, the prevention both for the workers and for the employer. There are two levels of prevention: (i) environmental monitoring and (ii) the use of personal protective equipment. The present research proposal aims at developing a novel concept to prevent respiratory diseases inside the specific working environment of a coating plant. The choice of a coating plant is considered strategic for the project execution for two main reasons. Workers of this environment are highly exposed to the inhalation of several damaging agents (voc, organic dust, chemical contaminants, paints, varnishes) that cause respiratory disease. The high level of ratio between number of operators and sales volumes all over Europe. 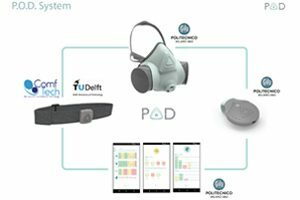 The objective of the project will be to design and prototype a plurisensorial wearable device with protective purpose, able to detect the air quality and the health conditions of the workers. The product will be also equipped with a device able to alert the user of hazardous conditions (voc evaporation or breathing problems) and to transmit the monitored data to the control room. The project will be developed exploiting technological solutions already/today adopted in medical field (i.e wearable monitoring systems for physiological parameters) and military ones (i.e the electronic nose developed by Nasa).